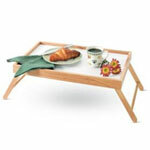 Often called a "bed tray", a breakfast tray is a small laptop table used for dining in bed. A sturdy breakfast tray can also act as desk for the bed or sofa. Some recent models are actually advertised as resting places for laptop computers.